This Memorial Day was our wedding anniversary. I baked a cake to celebrate. There was a to-die-for cupcake recipe I found from ConnoisseurusVeg. Eager to try it, but wanting a cake for the occasion I converted the cupcake recipe into a vegan double layer cake. Since the cake and frosting was flavored with orange, I made candied orange slices to top the cake. We had a lovely celebration as a family. We hiked at a nature preserve just minutes from our house. It was our first visit. I was surprise to learn there was such a wildlife escape near our urban home. We could still hear a basketball game happening just beyond a hill as we hike near the pond. Yet, we stood face to face with a deer calmly munching on a shrub while the children shrieked with delight. It is safe to say we have found a new family favorite destination at the local nature preserve. Hope you all had a lovely holiday weekend! Read on if you are familiar with candying oranges. I am hoping to learn from your experience. Otherwise, hop on down to the recipe to make the cake yourself. When I candied the oranges, I set them on a cooling rack after removing them from the cooking pan. I wanted them to cool and to allow the juices to drip. They didn’t appear to be dripping anymore so I stored them in an airtight container with wax paper between the slices. I stored them overnight till I frosted the cake. When I took them back out they were leeching more juices. Should I have left them out longer to set or would dehydrating help to keep them from leeching. If you have any orange candying tips, please share in the comments. Recipe adapted from ConnoisseurusVeg’s Mulled Red Wine Chocolate Cupcakes with Orange Chocolate Ganache Frosting. Deliciously rich complex chocolate wine cake. 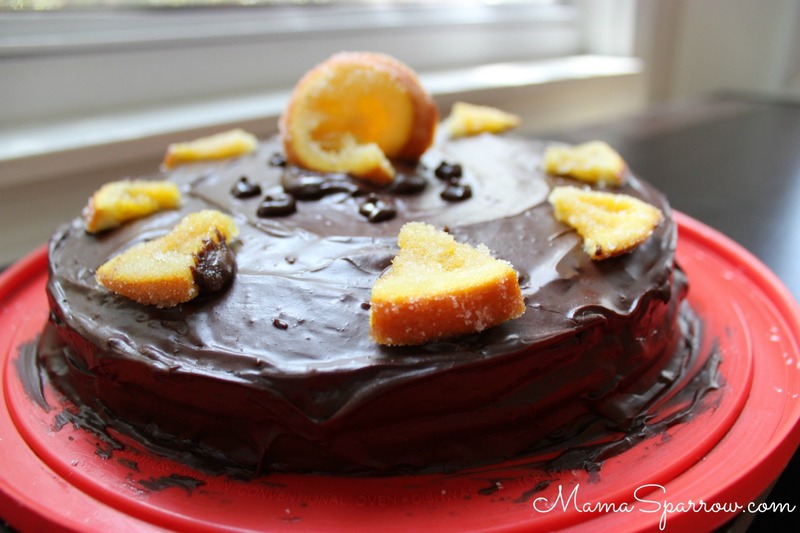 Chocolate orange ganache frosting and candied orange slices are a perfect complement. Preheat oven to 350F. Line 2 9in round layer cake pans with a circle of parchment paper. Lightly grease the pan sides and paper with coconut oil (melted or solid). Stir together the brown sugar, cocoa powder, baking powder, cinnamon, nutmeg, cloves, orange zest and salt in a large bowl or your stand mixing bowl, if using. Sift in the flour. Add flax mixture, red wine, canola oil and vanilla extract. Beat with electric mixer for a couple of minutes. Pause a few times to push mix down the sides of the bowl. Divide the batter between two cake pans. Bake 24 minutes or until toothpick comes out mostly clean. Allow to cool in pan a few minutes, then transfer to a cooling rack. Beat the coconut cream with an electric mixer until velvety. Add in 3 cups of powdered sugar and all other ingredients. Mix until thick and creamy. It additional powdered sugar is needed, add 1/4 cup at a time. Slice the orange crosswise, into 1/4 inch thick slices. Discard the ends. In a medium skillet, combine 1/2 cup sugar and water. Bring mixture to boil. Add the orange slices and cook over medium heat about 20 minutes - until thin syrup develops and slices become translucent. Turn the slices occasionally. Reduce the heat to low and simmer about 10 minutes - until the sauce thickens, but the slices are still sturdy. Again, turn slices occasionally. Transfer the cooked slices to a drying rack above disposable paper or a cutting board to allow the slices to cool and juices to drip. Save the syrup for another use. Place remaining 1/2 cup of sugar on a platter, Dredge candied orange slices in the sugar to create a sparkly effect. *Increase the recipe by 1/3 to create a third layer to the cake for a fancier occasion. The cake layers are thin, but dense and rich. I was satisfied with the double layer because of the richness and density of the cake. **Place can of coconut milk in refrigerator overnight. Open can from bottom and pour off watery part of the coconut milk. Measure out the thick cream for the frosting. Store extra in refrigerator. The thiner milk is great in smoothies.